"Cases of Lyme disease in dogs (Borrelia burgdorferi infections) are caused by infected ticks that attach to a dog to feed for at least 24 hours to several days. Once the tick attaches and feeds on the dog host, a spirochete or infectious agent moves from the tick's gut to the salivary gland, where it is then passed into the dog. At first, the bite will cause a skin infection. As the infection progresses it causes symptoms such as joint inflammation (polyarthritis) and in very rare cases kidney disease (glomerulopathy). 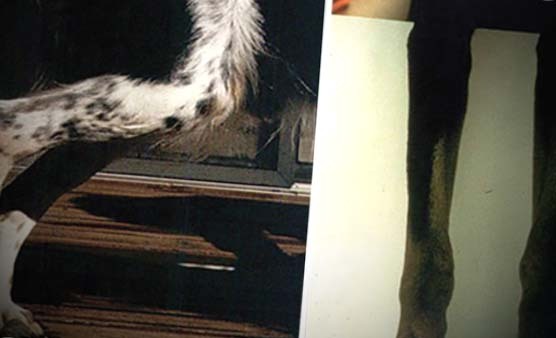 The bitten dog limb is the first to show symptoms such as as lameness or limping. The "bull's eye" rash seen in humans is not seen on dog skin. Laboratory SNAP or ELISA tests are used to see if a dog has been exposed, but does not prove that the dog has the disease. Dogs that test positive, but show no symptoms, are not treated for the condition since most dogs remain asymptomatic. 95% of exposed dogs do not show any dog Lyme disease symptoms(3). 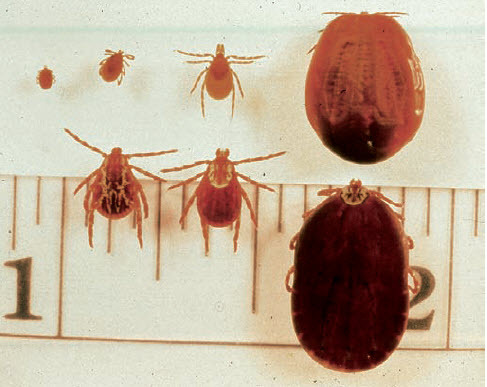 In these cases tick control products that protect or repel tick attachment are prescribed. If a dog shows symptoms, the prescription medication Doxycycline is used for 1 month. Dogs with canine Lyme disease start to show improvement in 1 to 2 days. The use of a lyme disease vaccine is considered by the American College of Veterinary Medicine to be controversial and are not generally administered. While the risk of side effects from the vaccine is low, many veterinarians believe that does respond quickly to sale oral antibiotics, making the disease less of a risk. Two doses of vaccine are given to dogs that have been treated with Doxycycline. (2)"
Dogs Were Diagnosed With Lyme Disease After Testing and Clinical Exam Which Showed Fever, Appetite Loss, and Lameness In Joints. Dealing with Lyme disease in dogs is not one of my most pleasant experiences. The thought of a parasite drinking the blood of my dog like Dracula is enough to make me squeamish. But with the risk of disease and infection it is important to look for ticks daily and to quickly remove them. There are many effective ways for Lyme disease dog treatment, tick removal, and prevention including Lyme disease vaccines. Lyme disease in dogs is caused by a bacterium that is carried by ticks. They attach to your dog and feed on its blood until the tick becomes enlarged. Ticks can cause local irritation, infections and Lyme disease. Tick season tends to be highest in the spring and autumn. To survive at each stage of their lifecycle, a tick needs to attach itself to a host such as a deer (their favorite), a dog or a person. When they get their fill of blood they drop off until it is feeding time again. This is why ticks cannot be passed from one dog or person to another, but a dog can pick up a tick in one area and cause an infestation in another, including your home (not the most pleasant thought). Ticks looks for the thinnest skin on the dog so they tend to attach themselves to the face, ears and abdomen. Ticks are difficult to remove because once they attach themselves they release a substance that glues their body to your dog. This is why the when removing a tick it is difficult to remove the body and the deeply attached head. Dogs outside of high-risk regions have a 1% chance of getting the disease and are generally not given the Lyme Disease Dog vaccine. Only 5% of dogs in a high-risk area show any symptoms with 80% of dogs showing Lyme disease bacterium (called B. Burgdorferi). Note that it is not clear if in the long term being infected with no symptoms is a problem later in your dogs life - such as future joint problems. A study by the Mayo Clinic College of Medicine and Science and Carnegie Mellon University predicts that rising temperatures related to global warming could increase the cases of Lyme disease by more than 20% by mid-century. (1)"
A tick that just attached itself to your dog will look like a small gray dot on the skin of the dog. As the tick grows it looks like a mark that just happens to appear such as a mole. The tick will attach itself for 5 to 7 days. You can tell it is a tick by the scales at its hind legs. As the tick drinks the dog’s blood it gets enlarged. When the tick is done drinking, it will fall off, consume the blood it drank, and then look for a new host such as another animal or person. See our guide to tick and tick bite pictures. All other states are low risk. Symptoms of lyme disease in dogs usually appear 2 – 5 months after your dog is infected. 95% of dogs that are exposed do not show any symptoms. Symptoms such as heart disease, renal issues, seizures and aggressive behavior are extremely rare. Lyme Disease in Dogs Pictures Do Not Have the Noticeable Skin Rash Seen in People. Effects of Lyme Disease in Dogs Are Commonly Painful, Swollen Joints and, Inability to Rise With Or Without Pain. Blood tests are not particularly helpful in determining if your dog has Lyme disease as there may not be any change in the standard readings. 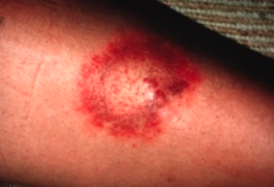 Rocky Mountain spotted fever and ehrlichiosis. The Serology test looks for enzymes in the blood associated with Lyme disease. The problem is that there are two types of vaccines (whole cell/killed Lyme or subunit). The ELISA test can tell if your dog has the disease only if it has not been vaccinated or it if had the subunit vaccine. If your pet had the whole cell the test cannot tell if your dog has the disease or a reaction to the vaccination itself. A newer test called the Canine SNAP 3Dx or the C6 SNAP test. It is done in your Veterinarian’s office and if positive a follow-up test is done and sent to a lab to confirm the findings. Lyme disease dog treatment is with the antibiotic Doxycycline, which is prescribed for 1 month. This medication results in a Lyme disease in dogs cure. Longer treatment may be necessary for dogs suffering from kidney disease or inflammation. You should see improvement in your dog 1 to 2 days after treatment begins. In rare cases, Lyme disease can cause kidney failure and death in dogs. Canine tick vaccines and vaccination are one possible approach for avoiding future cases of Lyme disease. However, not every veterinarian is in agreement as to whether or not they are necessary, even in areas with a high incidence of Lyme. Those that support the Lyme vaccine believe that it has no side effects and will prevent a dog from from problems that can be caused by Lyme such as arthritis and swollen joints. Those veterinarians that are opposed to recommending a Lyme vaccine for dogs believe that most dogs have minor symptoms that can be easily treated with antibiotics. They prefer to recommend over the counter dog tick medications that can keep ticks from remaining on your dog. Dog tick prevention and medication can be effectively accomplished with the purchase of a collar or topical treatment. These will cause ticks that are already on your dog to fall off. How to remove a tick from a dog using forceps or a tool like Ticked Off shown below. When removing a tick from a dog be sure to grasp the tick by the head and pull firmly straight from the dog. Dispose of the tick in a clear sealed container and save the tick in case it needs to be tested for Lyme or other tick borne diseases. There are inexpensive tick removal tools such as a Ticked Off that can be used to quickly and easily remove ticks. An inexpensive Tick Removal Tool such as this one is under $5 and makes checking and removing dog ticks easy. This brochure on lyme disease in dogs provides information on how lyme disease is transmitted, how it infests a dog, testing methods, clinical signs, and when to treat or not to treat. (3) Appel JMG. Lyme Disease. In Blackwell’s Five-Minute Veterinary Consult: Canine & Feline. Eds. Tilley LP, Smith FWK. 2007, 4th ed. Blackwell Publishing, Ames, Iowa. pp.784-	785. School of Veterinary Medicine, University of Pennsylvania, Philadelphia, PA, USA.